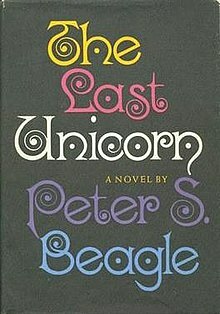 Having grown accustomed to immersive experiences with franchised and syndicated universes where consistency and canonicity are inviolate, we really appreciated this reflection on Peter S Beagle’s fantasy The Last Unicorn on the occasion of fifty years since its first publication. There’s refreshingly little world-building, pedigree to the characters or deference to rules or mythology—as compared to the digest of saga that many ascribe to—yet the book and later adaptations are enduring and perhaps ever more resonant. I recall alternately identifying with and being rather haunted by (animated) rather bitter Molly Grue, who eloped with the brigand leader Captain Cully allured by the romance of becoming a woodland fugitive, cursing the Unicorn, “Where have you been? Damn you! Where have you been?” demanding of the creature why she hadn’t come to her when she younger and fairer. The Unicorn herself would have probably never left her enchanted grove were it not resigned call of a group of hunters, realising that they were pursuing quarry that were protected by the Unicorn’s presence, to be careful as she may be the last of her kind. Though the Unicorn rejects this idea at first, eventually gnawing anxiety drives her out of the safety of the forest and on a quest to find the others. The Unicorn realises that most humans fail to recognise her as something rare and magical and instead see her as a stray mare. Through the indirect counsel of a butterfly, the Unicorn surmises that she must find the Red Bull who has been herding away her kind but is captured by a witch named Mommy Fortuna and made a part of her travelling carnival. Among the menagerie, only the Unicorn and fierce harpy called Celaeno are actual supernatural beings with the rest consisting of regular animals that the witch has enchanted (or the audience) to give the illusion of being legendary. An inept conjurer called Schmendrick (Yiddish for someone out of his depth) travelling with the carnival realises the Unicorn’s true nature and frees who—who in turn frees the other animals and the harpy, who kills the witch while escaping. Schmendrick and the Unicorn continue the journey and approaching the village that supports the castle where the Red Bull is said to reside, Schmendrick is captured by the second-rate band of outlaws that Captain Cully leads. The Unicorn comes to rescue him and attracts the attention of his wife. “It would be the last unicorn that came to Molly Grue,” she sniffed. The trio continues to the castle—and without giving away too much, our misfits end up happily ever after. Maybe this sort of fractured fairy tale is the kind we ought to attend to, not epic but rather applicable.